Out for Education is a Texas nonprofit corporation qualified by the Internal Revenue Service as a 501(c)(3) organization. All donations are tax deductible to the extent permitted by law. Donors of $2,000 or more will have a scholarship named for them, their business, or in honor of someone. Yes, we accept stock or securities, with certain limitations. Please contact us for more information. There is no minimum donation. We happily accept any amount. How can I get a scholarship named after myself or my business? With a donation or sponsorship of $2,000 or more, we will name a scholarship after you or your business, or in memory of another person. You will also be acknowledged on our website and in our year end report. Those donating less than $2,000 will be honored on our website and in our year end report. Those who wish to leave a lasting legacy may wish to create an endowed scholarship. Students complete applications. Students’ applications and/or essays are graded on several criteria by multiple reviewers. Students who pass the initial screening are interviewed by a panel of several community members. The scholarship committee recommends scholarship recipients to the board, who vote on them. Thus, there are several individuals involved in the process to ensure fairness to the applicants. How do I know the money is going to the student’s college expenses? Scholarship checks are sent directly to the bursar at the college or university. In order to receive continued funding, students must provide Out For Education with a copy of their transcripts each semester to ensure they are completing coursework with appropriate grades. For example a one-year, $1,000 scholarship is divided between two semesters. The student must show academic progress and continued enrollment in order to receive funding for the second semester. A: Our donation page offers many ways to donate. 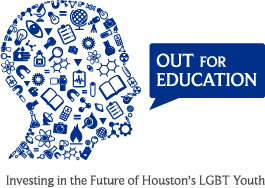 Out for Education is a 501(c)3 non-profit organization. Donations are deductible to the fullest extent of the law.